Sidney junior guard Andre Gordon dribbles with pressure from Butler’s Kort Justice during a Greater Western Ohio Conference American North Division game on Dec. 19, 2017 in Sidney. The teams will meet again in Sidney on Tuesday. ScoresBroadcast.com will cover the Tuesday night clash between Sidney (17-3, 11-2 Greater Western Ohio Conference American North Division) and Vandalia-Butler (18-2, 11-2) — two schools involved in several contests in recent years that have led to unusual results. In all five meetings dating back to 2016, the home team has won on the road, and the road team has won at home. “That’s a pattern we have to change,” said Yellow Jackets head coach John Willoughby, who will guest on the ScoresBroadcast.com pregame segment at 7:10 p.m.. Jack Kramer and Chuck McBee have the call. Tip-off is at 7:30. 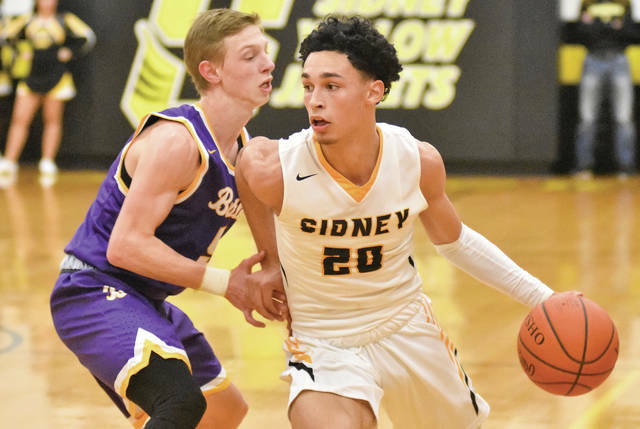 To win the GWOC North Division outright, Sidney must hold home court advantage on Tuesday evening and sweep the season series that began on December 18. Then, the Jackets rallied from nine points down with less than two minutes left in regulation. Sidney won 51-46 in overtime. In that game’s final 95 seconds of the fourth period, Ratez Roberts started a fast break hoop with a huge block and also tallied on a stick-back, three-point play. Early in a possession, Keith Lee drained a long triple. Andre Gordon created a steal and raced to the rim for a slam dunk. Andre Gordon is fourth in the Greater Western Ohio Conference (GWOC) in scoring at 23 points per game. Ratez Roberts is first in both blocked shots and rebounding at just under five swats and ten boards per outing. Sidney’s Trey Werntz has upped his three-point percentage to nearly 40. Keith Lee is right behind at 37 percent. Butler wide body Quentin Glover is the GWOC’s top field goal percentage shooter at 63. Michael Kreill leads the Aviators in scoring at 15 points; he shoots 53 percent from the floor. Braedon Norman, an uncanny three-pointer gunner, is hitting at a 45 percent clip. SCORES, the Shelby County Online Radio Entertainment System, features either Fort Loramie at Botkins or Jackson Center at Fairlawn on Friday, Feb. 15. Webcast time is 7:40. The online service offers Anna at Minster this Saturday night at 7:10. The Anna at Russia tilt on Feb. 19 is also at 7:10. Anna likely needs to win that game to earn the outright championship for the Shelby County Athletic League. Despite several media, including television, being present for the Fort Loramie game at the Hoosier Gym in Knightstown, Indiana, last Saturday, SCORES was joined simultaneously by 733 IP addresses midway through the fourth quarter. “I am no longer amazed by the popularity of SCORES,” said Todd VanTasel, CEO and VP for Technology at Christian Netcast, which performs the hosting and serving for the ScoresBroadcast site and its streaming. Most contests are usually archived within a few days after their completion.